Shearwater is the stuff of lore. Unlike most post-rock outfits of their kind, the Austin five-piece steer clear of long-winded, psychedelic schtick in favor of something far more palpable and if nearly theatric in its approach. Their songs unfold like some lost epic poem, evoking an almost mythic iconography of vast landscapes, predatory beasts of the deep and climactic battle sequences. While such epic backdrops have typically been more comfortable among prog metal acts like Baroness, Shearwater share a closer kinship with, say, Midlake’s “fair maiden” pastorals, or mid-period Talk Talk’s slow-moving orchestrations. But where Midlake, in particular, tends to focus on more bucolic, or domesticated subject matter, Shearwater albums read like stretches of heroic verse. Jonathan Meiburg’s melodramatic vocal delivery and their loose, film-score structure feels far more panoramic in scope, meandering like a generations-old folk fable. Their latest, The Golden Archipelago, expands this concept farther than Shearwater have yet dared, making for their most developed and best album yet. The 74-page dossier accompanying the album only further aligns the band with these grand adventure tales as it is, itself, a Herculean undertaking, complete with WWII-era sketches and journal entries reminiscent of Meiburg’s grandather’s experiences as a radio operator in the South Pacific theater. Meiburg’s own island hopping across the Falklands, the Galapagos, New Zealand territories and a remote Aboriginal settlement, among others, may only be secondary details to the album’s far-reaching musical ambitions, but their effect has been clearly stamped across every one of these 11 tracks. The opening moments of “Meridian” capture a unique rendition of the local anthem of the formerly inhabited Bikini Atoll, located in the Micronesian Islands, as sung by natives in exile after atomic tests left the strand desolate a half-century ago. This leads into a subdued, yet emotionally poignant telling of an air raid on an island military outpost, before bleeding into the call-to-arms procession of “Black Eyes.” The Golden Archipelago is hardly conceptual in nature, though, as it’s far more concerned about the telling than the story told. As their titles suggest, songs like “Landscape at Speed” and “Uniforms” play like valiant marches, while “Hidden Lakes” or “God Made Me” are more ruminative, even fantasy-driven interludes, and crowning moments “Corridors” and especially “Castaways” give the album the fire-eyed lift it needs to strike its balance. Dense layers of precise mallet percussion, sparse instrumentation and orchestral swells interplay perfectly with Meiburg’s ability to sound as contemplative as purposeful, being so closely miked as to capture every stray click of the tongue as full-throated charge. Even at its boldest moments, The Golden Archipelago is hardly looking to slake a militant bloodlust, but rather mourn the ravaged culture and lush beauty of the landscapes it surveys with lyrical awe. Closer “Missing Islands”’s moving piano, creeping string dissonance and eerily calm cymbal splashes are a prime example of this as the entire record fades into a sad, anticlimactic finish. 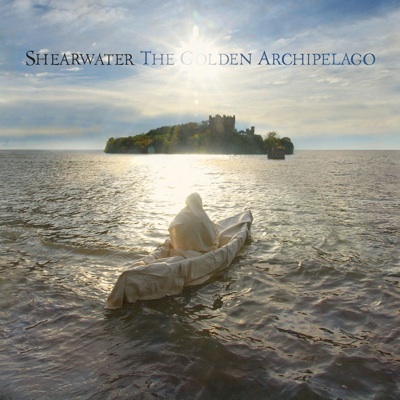 As such, Shearwater are not only utterly unique, but sages at their craft.